ISKCON is Changing Srila Prabhupada's Books -- Hare Krishna! Jayadvaita did not only correct typographical errors. He has changed many things. There are thousands of changes which are completely unnecessary, change for the sake of change. Many of the changes alter the meaning of the text amid thousands of petty changes which apparently do not change the meaning. It is not our business to amend the words of the Supreme Personality of Godhead or make additions or alterations, as it has become a custom for many so-called scholars and swamis who comment on the words of Bhagavad-gita. Soon after the intense marathon for completing the publication of Caitanya Caritamrita, Radhaballabha prabhu approached Srila Prabhupada and mentioned that the artists are now completing the paintings in preparation for the second printing. To this, Srila Prabhupada replied “NO changes”. Hayagriva spent many hours with Srila Prabhupada, discussing the different aspects of the editing work. They went over each verse extensively, and Srila Prabhupada was actually quite clear in expressing what he wanted. The greatest anxiety Srila Prabhupada has is that after he’s gone we will make changes in his books and the whole work, the plan Prabhupada was working on, it will all be spoiled by us because of our tendency to change. Is ISKCON Editing or Changing Prabhupada’s Books? Why did BBT made radical changes to Page 1 of Caitanya-caritamrta? Following is an email exchange I had with Jayadvaita Swami on his changes to Srila Prabhupada’s books. I believe that I defeated him within two emails. 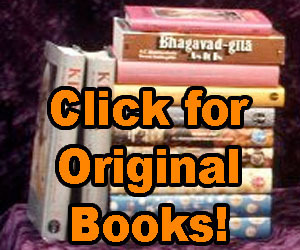 Both books contain illustrations from the Macmillan Gita with additional paintings and a different photo of Srila Prabhupada added to one of the books. Many changes have been made to Srila Prabhupada’s books since his departure in 1977. As we all know this has caused a lot of controversy. This e-book presents new evidence to the effect that the BBT International, and Jayadvaita Swami in particular, have overstepped their authority by making changes that Srila Prabhupada did not want. ISKCON’s unauthorized changes to Srila Prabhupada’s books are the most important issue that we, as followers of Srila Prabhupada, have to clearly understand. Our connection to Srila Prabhupada is through his transcendental books and as he says: “I am living in my books.” So if someone starts messing with Prabhupada’s books he is trying to put himself between Srila Prabhupada and us, the followers of Srila Prabhupada. Again we see that Jayadvaita Swami’s and BBT International’s claim – that they are making the books “closer to Prabhupada” – is false propaganda. Many, many changes – hundreds (if not thousands) – are further away from the words that Srila Prabhupada originally wrote or dictated. The letter accurately summarizes the editing principles of the BBT and captures the mood of Jayadvaita. The Swami claims he did not write it, and that is most likely true. But the change to Srila Prabhupada’s Sri Caitanya-caritamrta revealed in this letter is a real change. The BBT International can’t justify this change from “owner” to “knower” in BG 13.3 by referring to the so called original manuscript, Prabhupada’s desires, to faulty Sanskrit translation, to meaning, to spelling or to grammar. The change disease has gotten to the point where devotees are being demonized for wanting or distributing these same books we grew up with and happily distributed, because we knew it pleased Srila Prabhupada so much. When Jayadvaita Swami says: “the obviously erroneous “regulated principles” — a term that makes no sense” we must know that this is his opinion only, and it differs with Srila Prabhupada’s. It is a major problem that every time something doesn’t make sense to Jayadvaita Swami he must change it till he can understand it. This is not the behavior of a disciple. Who is Qualified to Write Transcendental Literatures? Gita Cover-Up Alert or Buyer Beware! Prabhupada and Hayagriva worked together on editing the Bhagavad-gita daily during the almost three months while Hayagriva Prabhu was living with him in the San Francisco temple. Hayagriva went through practically every verse with Srila Prabhupada. Jayadvaita tries to eliminate all this work on the Gita by Srila Prabhupada by going back to the first draft. Can I Trade For That Original One? The Spin Doctor Has Gone Too Far!